This is Day 19 of our 31 Days of Less & More challenge. To read all the posts in order, start with Day 1, then visit the Overview Page to see the entire series. My kids are now four and seven–old enough to be wising up to a few of my, um, minor deceptions–but somehow I’ve still been able to convince them that having more than one sugary sweet per day could have Very. Dire. Consequences. They even self-regulate. Oh no mommy, I can’t have a cookie. I already had a lollipop today. Bless their trusting little hearts! If only I could show the same restraint! I never had a sweet tooth until I quit smoking. But I quit and suddenly I couldn’t get enough sugar. I craved donuts and chocolate and candy and ice cream and pie and gained twenty pounds in six months. Yikes! While ten years later I’m thankful that I managed to say goodbye to cigarettes for good, and while I also know of the two vices, sweet stuff is definitely the lesser of two evils, curbing my sugar consumption is still a daily battle. Judging by the size of my secret candy stash in the cupboard, it is one that I am probably still losing. So since I have zero pearls of my wisdom or success on this topic to offer you, I thought instead today I would perhaps find some motivation elsewhere. Drinking sugar-filled drinks such as soda, fruit drinks, and sweet tea can not only cause weight gain, but also increase your risk for developing diabetes. The sugar enters your bloodstream faster in liquid form, which over time leads to insulin resistance. Yikes! A diet high in sugar can cause acne. Ew. Eating too much sugar can also harm your heart by lowering your good cholesterol. Uh oh. 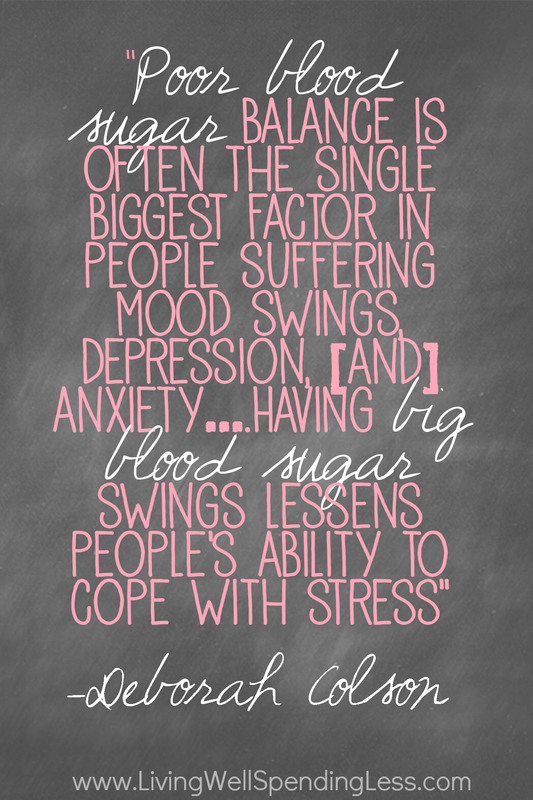 A diet high in sugar and carbs causes mood swings and can increase your chance of depression. Bummer. Sugar in various forms has been linked to several different types of cancer. People who drink soda are at higher risk for pancreatic cancer, while women with high blood sugar are far more likely to develop breast cancer. Scary! Those are some pretty convincing reasons to let up on the sugar, don’t you think? I’ll give it a try if you will! Be sure to read Edie’s corresponding post, More Cooking. Plan a healthy, low-in-sugar menu for the coming week. Use some of the ideas from Edie’s post, if you’ve never done this before. Think about your schedule and what night’s would be better for something in the crock pot or oven all day. Make your list and then grocery shop tomorrow for what you need. You CAN do this!! You’ll be so happy and organized with your week’s menu all planned out. Share your menu ideas with us in the comments below on Facebook! Do you have a weakness for sweets? How do you curb your cravings? I joined dietbetter.com. I think you introduced this site to me. It was the only way to start the discipline of eating healthier. I cut out sugar and cut down on portions and walk more than usual. I am an ice cream addict and was eating it every day. I was on the verge of needing to buy clothing in a larger size. In one month, I’ve lost about 6-8 pounds. I think I’ll do this for another month, and then allow myself one sweet treat per month from then on. We’ll see if this indulgence ends up with a wild sugar binge. I hope being mindful of this will change my nasty habits for good. Oh I almost couldn’t click on to read I’m such a sweet tooth. I have no tips other than drinking water helps lower blood sugar so that’s one thing I can do to counteract my consumption . Your skinny pumpkin bread is in my oven right now. I really love your blog!! Sugar is quite simply evil. Have a read of this National Geographic article on sugar – it might help you avoid those cravings. I cut all sugar out of my diet and found that after a couple of weeks if I tried soemthing sweet it actually tasted horribly so and I really didn’t enjoy it. If you are serious about wanting to cut way back on sugar try taking some chromium supplements as these help keep the cravings at bay. Oh and one thing to watch out for is all the hidden sugars in foods – a lot of people think that low fat products are healthier for them, what they often don’t realise is that they have been bulked up with extra sugar in place of the fat. Oh, man. This has been a challenge I’ve been trying to deal with, lately. I’ve been doing better about curbing my processed sweets intake (Only had dessert three times, this week! That’s really good, for me!) by making snacks at home (sugar free date-nut snack bars, savory snacks like socca, etc) since I tend to be a grazer, and by eating yogurt instead of “real” sweets when I have a sweet tooth. I’d eventually like to cut my sweets intake to no more than 2 desserts a week, and stop eating sweetened yogurts, eventually, but I’m taking it slow. It’s a big change from when I was a kid; I grew up having dessert once a week, MAYBE, and the sweetest things we’d eat in between were fruits! No more sugar 🙂 I have lost 25 pounds to date. It really works. This is so true. I’d developed an AWFUL soda habit over the years. When I went in to get my teeth cleaned, it was the worst check-up I’d had in my entire life. No joke. My dentist said it looked like I hadn’t brushed or flossed my teeth in over a year. I slowly had to ween myself off of it, but now I can go days without drinking soda and feel much better. I’m also an emotional eater and go right for the sweet stuff. I’m on a mission to drop weight and look good at my mom’s wedding. It was tough to give up the yummy foods, but it’s been awesome to see the change both inside and outside. I heard on the Hidden Brain podcast that rather than saying ‘I can’t eat sugar’ or ‘I can’t drink soda’, say ‘I don’t eat sugar’ ‘I don’t drink soda.’ It puts us in a more positive position of control. I don’t eat sugar or drink soda, because it’s a choice, not I can’t because of some outside edict.